Don Cherry, alias The Kissing Bandit, planting a smackeroo on Doug Gilmour’s cheek. This was part and parcel of the gala celebrations surrounding number 93’s jersey being hoisted to the rafters of the Air Canada Centre. “Grapes”, a fellow Kingston-ite, played his “he’s the greatest hockey player in the world” tribute to the hilt—squeezing every ounce of publicity out of his appearances—as usual! Essentially it was a déjà vu scene. On March 19, 1993, when Gilmour was efficiently strutting his stuff with the Maple Leafs—displaying unusual grit as Toronto’s on-ice leader—Cherry had uttered that same accolade and sealed it with a kiss on HNIC. Dougie had proven himself the hero in the first game of the Toronto/Los Angeles playoff series, and was somewhat embarrassingly rewarded in front of the cameras following the win. This was not the first time the Coach’s Corner icon had pulled this stunt on national television. In 1999, when The Hockey News was in the midst of releasing its “Top 50 Players of All Time”, Cherry used his between-periods slot to include his number one pick, namely, Bobby Orr. The clip ended with Grapes smooching the Pride of Parry Sound on the cheek—a peck which had taken place on December 15, 1990. (He had already done a warm-up run on Dale Hunter on March 5 that year). Later, during a re-run of those exact sequences, Orr appeared out of nowhere, startling his former bench boss by returning the favour. For once the normally verbose snappy dresser had no quip ready! In recent years instances of bussing have become more common among professional pucksters—even to the point of becoming a bit tiresome. The most recent one which comes to mind involves that same “Grapes”, on March 20, 2013. When Nazem Kadri was interviewed on HNIC following his initial NHL hat trick, he was treated to Cherry’s pucker up peck. Another lip caress still fresh in memory featured the King’s Drew Doughty congratulating goalie Jonathan Quick that way following his stellar effort in a 4-1 triumph over the Avalanche. That was not the only instance of smooching in 2011. While still with the Rangers, Brandon Dubinsky was so elated over pulling off a hat trick he planted a big one Derek Stepan after the duo skated to the New York bench. On December 21, 2010, Andrew Gordon lost all his inhibitions after tallying his first marker of the season, taking it out on Marcus Johansson in this daring manner. Still on record in the New Millennium are two smackeroos, both of which originated from unlikely sources, but were instigated by “kiss cam” features on the big screen in arenas during game action. In January 2002, the scoreboard operators scanned kissing couples in Philadelphia. Suddenly they paused at the Flyer’s bench where Jeremy Roenick planted one on Mark Recchi’s cheek. Perhaps even more surprising, a year earlier, the stayed Steve Yzerman imitated this action in the stands by bussing the bearded Martin Lapointe. On November 16, 1987 New Jersey’s rookie Brendan Shanahan scored his first NHL marker. It turned out to be the winner in a 3-2 triumph over the neighbouring Rangers. He demonstrated his gratitude toward Claude Loiselle, who assisted on the tally, by giving him a wet one on the cheek. “I kissed Claudie! I knew I was going to kiss the guy who assisted me. I don’t know if he noticed it”, was his explanation. Loiselle noticed it—and so did the rest of the Devils. Probably, because of the aforementioned expression of admiration by Cherry for Gilmour, some industrious photographer recently dug out a 1999 candid shot taken of the St. Louis Blue’s player’s bench. It focused on little known Chris McAlpine pecking veteran Doug Weight on the side of the face. But smooching incidents, courtesy rough and tough shinny competitors, though few and far between, are not just of recent vintage. As the 1931-32 NHL playoffs moved into the second round, the belligerent Montreal Maroons were pitted against the Detroit Falcons (who later became the Red Wings). It was a two-game, total-goal series, with the Canadien’s English-speaking counterparts coming out on top three goals to one. The gnarled old blueliner, Sprague Cleghorn, was so happy that he grabbed “Hooley” Smith and favoured him with a big smacker. Poor Reginald—he nearly fainted—he was so shocked at this display coming from this former mortal enemy. Previously their animosity had dated back to the days when Smith was with Ottawa and Cleghorn was Boston Bruins. The next year’s post season included that memorable April 3 (and 4) marathon overtime between the Leafs and Bruins. The story has been told dozens of times about management’s suggestion to flip a coin to determine the winner, and the players’ angry refusal. At long last, at 104:46 of extra time, little Ken Doraty scored the game’s only goal, giving Toronto the win. Amidst the combination of grateful relief for the Queen City six, and the devastation of the Beantowners, the normally dour Art Ross kissed Clancy as the teams shook hands. According to that same Irish leprechaun, five years later, Toronto’s caustic owner, Conn Smythe, who maintained a standing feud with the Boston manager. The “Little Major” constantly bated the Beantown executive, and once, Ross responded by publicly chastising Smythe for “having no class”. In retaliation the latter appeared at the Boston Garden in tails and top hat, which irritated the fiery icon no end. Even though, if the whole truth were known, irony could be written all over it, Smythe commissioned “King” Clancy to skate a dozen roses over to Ross in his executive box—a supposed “get well” token following the latter’s surgery for hemorrhoids (the bouquet included large ugly thorns, and an uncomplimentary note in Latin). Nevertheless, in mock gratitude, Art responded to the gesture by kissing Clancy on both cheeks, French style. Camille Henry battled hard to make it to the Big Time. At 5’ 9” and 152 lbs, he took all kinds of abuse around the net at the hands of the larger and tougher rearguards of the “Original 6”. He was so battered that he had to wear a specially designed corset which enabled him to survive the abuse. He was nicknamed the “Eel” because he was so slippery around opponent’s nets, enabling him to slip the puck behind netminders in a flash. This not only baffled those guarding the twine, but irritated the big bruisers whom Henry gave the slip. One night an opposition skater, who outweighed him by several dozen pounds, slammed him into the boards and pinned him there. “Now! Watcha gonna do?”, taunted the bully. Cammy simply leaned forward and smooched him right on the mouth! The vice-like grip was quickly loosed. During that same era, when Gaye Stewart was skating for the Rangers, Chicago’s Ernie Dickens dumped the fast-skating forward over the boards in Madison Square Garden. He landed on the lap of a portly gentleman who was nursing some suds. The beer went flying one way, but Stewart spied a sweet young thing sitting on the other side, and proceeded plant a kiss on her cheek. He quickly helped the man up, and took off over the boards into play before the beauty could react. Probably it’s the least publicized incident of this kind because it was overshadowed by the overall hoopla of a very special moment in the history of the Maple Leafs. In fact, the photo of Bill Barilko’s overtime tally on April 23, 1951, rivals that of Bobby Orr’s airborne finish to his famous playoff tally. Typically, he was congratulated by everyone from the stick boy to the club’s rambunctious owner, Conn Smythe. Cal Gardiner and Bill Juzda hoisted him onto their shoulders in traditional style. And when they arrived in the dressing room, Al Rollins, who had replaced the ailing “Turk” Broda between the pipes, walked over and bussed him on the forehead. 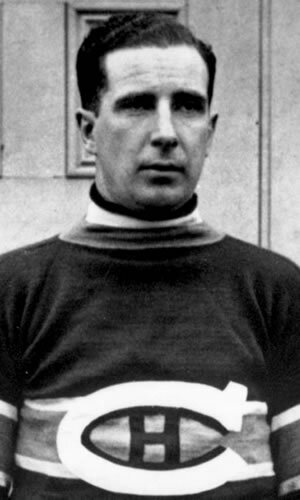 One of the most difficult records to match in Canada’s National pastime was the one held by super goalie, Terry Sawchuck—an amazing of 103 career shutouts. Of course the Devils’ Martin Brodeur has since matched and passed that mark. But on February 1, 1970 that “Ukey”, as he was called by his mates, withstood every endeavour by the Pittsburgh Penguins to dent his armour. With the shutout clearly in sight in the final frame, his Ranger sextet doubled their efforts to protect that magic goose egg. When the buzzer sounded the triumphant goalie raised his arms in a “V”, as the rest of the team streamed from the bench to congratulate him. Brad Park was the first to reach him. He made his felicitations count—he smooched him right on the sweaty forehead. In those days it was more than an unusual expression—but it was touching moment in honour of a shinny legend. Paul Stewart, who eventually became a referee in the NHL, was a journeyman in the majors, playing but 21 games with the Quebec Nordiques in 1979-80. For him it was very special to play the first of those matches in his hometown of Boston. Jacques Demers was behind the Nordiques’ bench at the time and arranged for the minor league enforcer to join his squad for a date in Beantown. The bombastic farmhand promptly got into three scraps with Terry O’Reilly, Stan Jonathan, and Al Secord. It earned him three major penalties and ejection from the game. But he was grateful to the Quebec bench boss for giving him a chance to show his stuff. It resulted in a little different spin on the normal stories about this expression of affection. He went right to where Demers was staying, knocked, and planted a big wet one on him as soon as the door was opened to him. From hither and yon come variations of kissing tales. For instance there was Glenn “Chico” Resch’s version. In the spring of 1978 he stood between the uprights for the New York Islanders against the Pittsburgh Penguins. At that time Jean Pronovost was lighting goal lamps with his scoring prowess. And, true to form, during that series, he bore in on the effervescent backstop and let fly with a zinger. But the disc hit the goal post and darted harmlessly away. The relieved backstop promptly moved over and kissed the metal “goalie’s best friend”! At least there was no chance of a retaliatory slap in the face! In 1999 comes a twist which is unique—at least in its ending. The IHL’s Fort Wayne Comets were battling it out with the Michigan K-Wings, when Eric Boguniecki got in the face of Mel Angelstad, and was jawing away at his opponent. But instead of dropping his gloves to duke it out, the latter kissed his avenger right on the lips. BUT HE WAS GIVEN AN UNSPORTSMANSHIP PENALTY FOR HIS TROUBLE. Two minutes for being a bad role model? And lastly, Steve Ott chose to add still more diversity to this physical expression. Last season, during a match when his Sabres were hosting the Maple Leafs, he and Dion Phaneuf were pounding one another all night. During one series of retaliatory bumps, the Toronto rearguard got in the last lick. And, as the current Buffalo captain picked himself up off the ice, he BLEW a kiss to his assailant. Well! Variety is still the spice of life!